Air India SATS Airport Services Pvt. 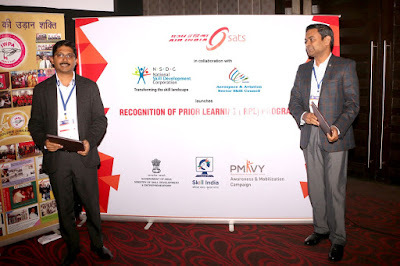 Ltd (AISATS), India’s premier airport services company today in partnership with National Skill Development Corporation (NSDC) and Aerospace and Aviation Sector Skill Council (AASSC) launched Recognition of Prior Learning (RPL) certification program for its employees. AISATS is the first ground handling company in India to launch the RPL program, under which, employees will be assessed for their knowledge, skills & aptitude acquired while on the job as AISATS’ employees. On successful completion of the assessment, applicants will receive a certificate from NSDC and AASSC. The RPL platform will facilitate AISATS to provide additional recognition to its employees. Recognition of Prior Learning (RPL) is a flagship program under Pradhan Mantri Kaushal Vikas Yojana (PMKVY) scheme of the Ministry of Skill Development and Entrepreneurship (MSDE). The scheme plans to impart skill based training to one crore people. The pilot batch of RPL certification will commence in Bengaluru with an aim to certify 1700 staff. In the next six months, AISATS will roll out this program at its other locations in New Delhi, Hyderabad, Trivandrum and Mangaluru with a target of certifying 4000 employees.